Research shows that mobile apps are transforming the way customers and employees interact with your business by enabling improved customer communication, empowering new business models, and generating new customers. Let the experts at Elegant Codeworks help you realize your mobile vision today! Get noticed with a sleek mobile app from Elegant Codeworks. Reach every potential customer. Interact in new and engaging ways. We are the Android and iOS experts. 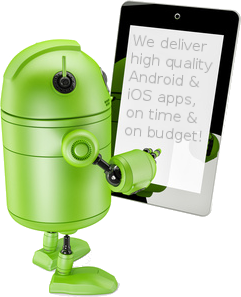 Our mission is to build high quality mobile apps that deliver great value, enrich lives, and inspire people. "Creating beautiful technologies that are as simple as possible, but no simpler."